The weather seems to be crazy all over the place this year. If you are in need of a bright ray of happiness these "painted" cookies are super easy and super cute! I wanted the flower cookies to be a little whimsical and not quite as perfect and symmetrical as flower cutters are made. Besides which, for some reason it seems whimsical flowers always have 5 petals and it is oddly difficult to find a good selection of 5 petal flowers. 6 petal flowers cutters are everywhere. 5 petal...not so much. As it happens though, you don't need flower cutters at all! 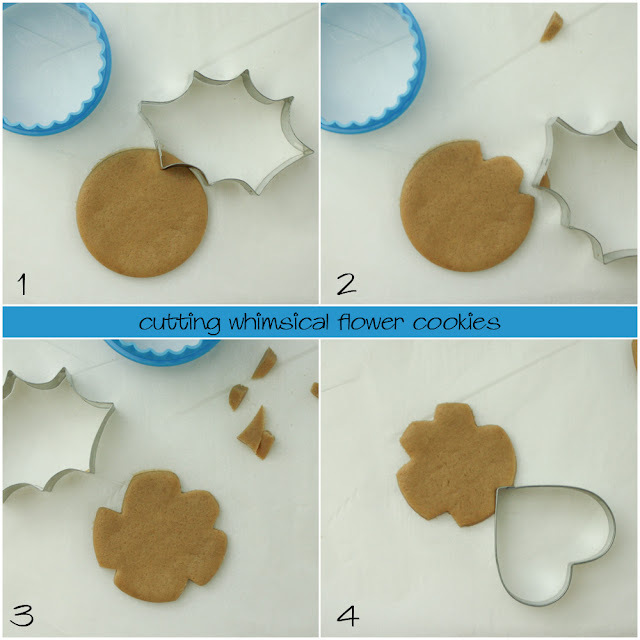 To cut whimsical flower cookies you'll need circle cutters or other roundish shapes and a holly cutter. Start by cutting the circle. Continue working your way around cutting petals of different sizes. If you don't have a holly cutter you could also use the point of a heart or a star cutter. The heart cutter will give you a little sharper edge on the petals but you can just smoosh them with your finger. Once the cookies are baked and cooled flood them in white royal icing and let dry fully for 8-12 hours depending on the humidity in your area. Using a fan will help the icing dry and the base-coat will be shiner too. The painting step is really easy and it goes pretty fast. 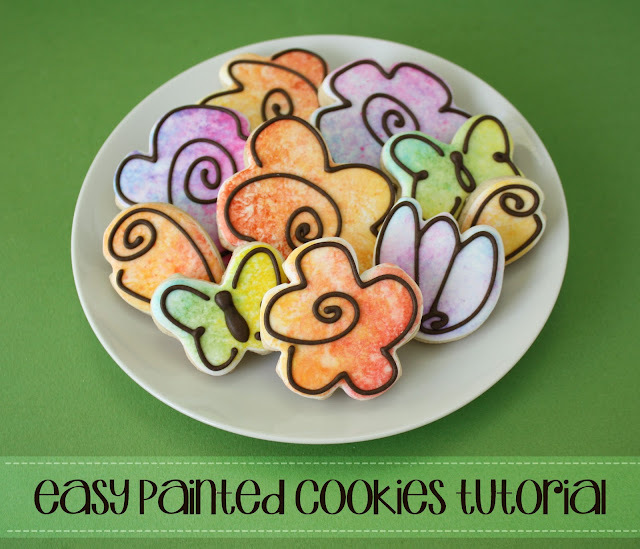 Plus, you don't have to mix icing colors, Yay! I made these little paint daubers by twisting a small square of paper towel around a ball of plastic wrap. 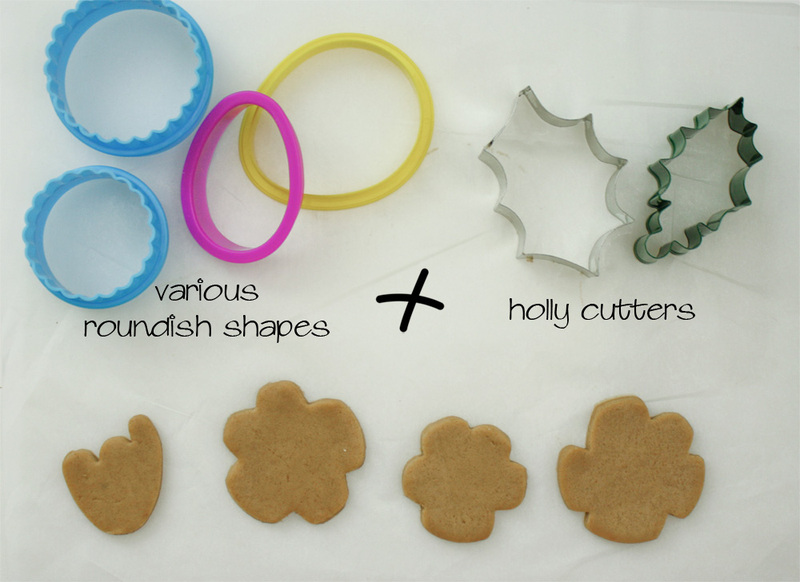 The texture of the paper towel makes a nice effect on the cookie and you can keep lots of clean ones on hand. Wet the dauber a little and pick up the first food color patting off some of the excess. Then dab the color on the cookie. You want to use a pat pat pat motion when applying the food color. If you drag or smear the color you'll lose the texture. Use a clean dauber for each different color dabbing a little color to start and working up to the coverage you want. If you add more color than you like you can use a dauber with clean water to dab the cookie. Then quickly pat off the excess with a dry paper towel. I think it's best not to do that too much though as you can overwork the surface of the cookie. There's no right or wrong look to these cookies so just let them be spontaneous! On a side note, the odds are pretty good that your hands will be stained every color of the rainbow when you are done. I don't mind having blue and pink hands but if you have a big to-do that night you might want to wear plastic gloves. 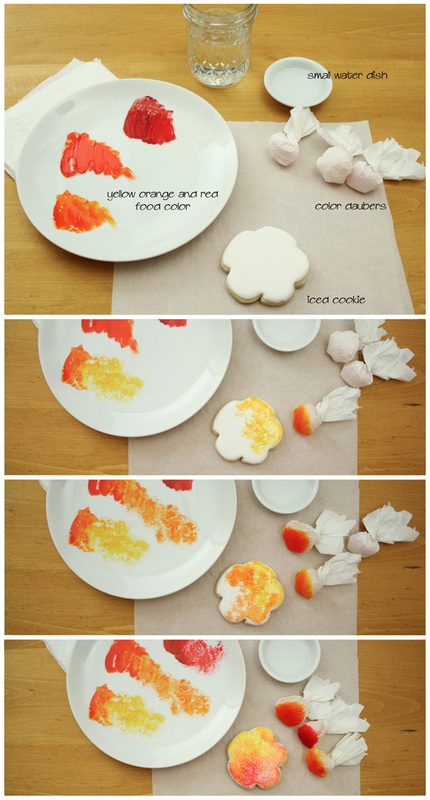 You can also add some spatters to the cookie by flicking the food color with a brush. 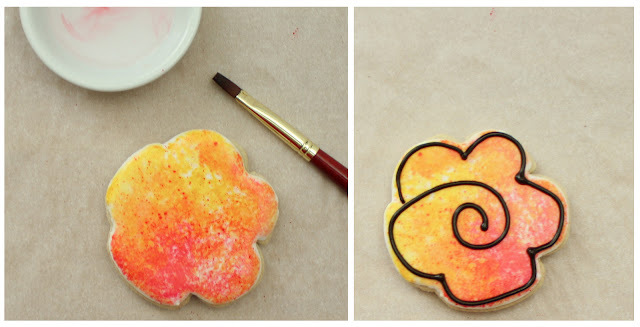 Let the food color dry on the cookie for a little bit and then pipe a swirl in royal icing. That's all there is to it! I think it takes longer to describe the process than to actually paint them. Have a great weekend and enjoy the sun if you have it!